Melbourne is embarking on a major investment in rail capacity. It needs to address a legacy of decades of underinvestment and provide for the transport demands of a rapidly growing city. The new agency Melbourne Metro Rail is leading the development of a $9-11 billion rail tunnel across the CBD from South Kensington to South Yarra. But what problem is the new Metro Rail tunnel trying to resolve? The received wisdom is that Melbourne has too many passengers to fit onto too few lines. The reality is more nuanced. The Age recently reported on the six problems ruining Melbourne’s rail network, none of which was lack of route capacity. The key inadequacies are with signalling, power supply, run-down stations and, critically, junctions where trains cross each other. The proposed tunnel will run from Kensington through the CBD to South Yarra. So will this provide a complete new train line? Sadly, no. The tunnel will not increase the number of lines, it merely redirects some via a different route across the CBD. This will actually reduce services on existing lines approaching the CBD. It could be a very expensive diversion. It will also take too long. The rapid growth in rail passenger demand is expected to peak in the next 3-5 years. Melbourne needs a quicker solution, and one which is less risky in engineering terms. The cut & cover construction of the tunnels beneath Swanston Street will entail massive disruption to the CBD over several years, including the major re-routing of trams. The economic cost of this disruption has not been specified. So what is Melbourne trying to achieve? Let’s take a step back and consider three factors. First, Melbourne already has five cross-city routes which can each, if operated at current capacity, provide 24 trains per hour (tph) in both directions. The City Loop can provide two routes, with three between Flinders Street and Southern Cross. That’s 240 tph trains into the CBD, plus the Sandringham line and regional V/Line services: over 50% more than at present. The second is the aspiration of the strategic planners for Melbourne to grow its core beyond the CBD, and to integrate a network of economic clusters in the suburbs and beyond. These will need rail links, and the only rail network that makes sense is a web of cross-city lines, which links the hubs and allows the CBD to grow. The third is the most obvious: modern metro systems provide a simple pattern of high-frequency routes which allow multiple journey options. Turn up and go, easy interchange, straightforward. Think London, Paris, Hong Kong… anywhere but Melbourne. The key problem with the city’s rail network is not capacity. It is the configuration into the City Loop, which is throttling the city and limiting the capacity of the network overall. It is inefficient to operate and baffling to occasional travellers or visitors. Worse, it concentrates large radial flows of commuters into a small city core, and therefore thwarts the aspirations of Melbourne’s strategic planners. Indeed, the Loop is so strange that the Public Transport Users Associationprovides diagrams to show you how to navigate the network at different times. Threading trains onto the Loop also provides headaches for the train operator which, paradoxically, appears to be a major driver for the proposed new CBD tunnel. The alternative network proposed in exhibits 1 and 3 above provides five routes across the city: segregated, frequent, easy to understand. Capacity is released simply by untangling the Loop. Compare it to the PTV concept map. Currently there are five main rail routes from the south/east but only three from the north/west. So you need to build two more heading west, and initially these can be modest extensions. The new infrastructure required is modest compared to the Metro CBD tunnel. It provides new links to urban renewal areas on the CBD fringe: to Fishermans Bend, eGate and Docklands. It is easier building rail into these now, and this will help galvanise redevelopment. Beyond this the main infrastructure requirements are new connections to the Loop lines at Richmond and North Melbourne, a fourth track from Burnley to Camberwell and grade-separation of junctions at North Melbourne. The game changer for the Victorian government is that this can be achieved cheaper and quicker than the CBD tunnel, and with less risk. The transport planners can identify the easiest cross-city route, segregate it and launch it as a 24 tph re-branded cross-city service. The travelling public will then buy into the strategy, and each new phase will be easier to achieve. But the real benefits for Melbourne run much deeper, and are longer-term. 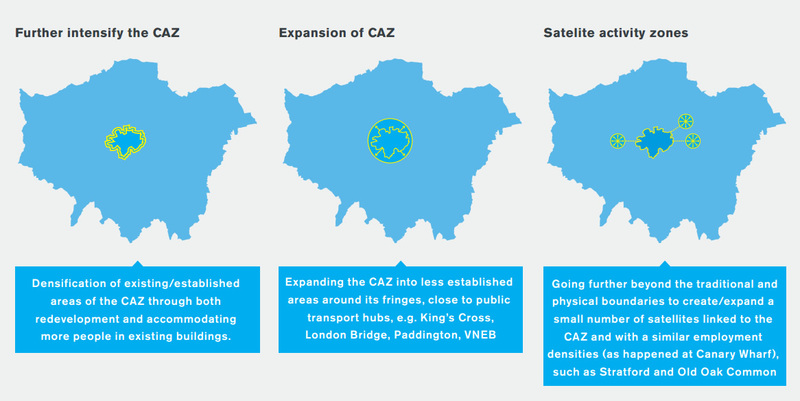 Look at the London 2050 options below: a more concentrated CBD, a bigger CBD or a CBD with economic hubs? This is a familiar conundrum for cities worldwide. Can Melbourne leap-frog this by pursuing its current strategy of growing the CBD and developing suburban clusters? Herein lies the problem, and this is why the Metro CBD tunnel is deeply flawed. Melbourne does not need major new rail infrastructure in the CBD: it needs it in the suburbs. Express trains and regional V/line trains share tracks with metro routes through the inner suburbs. This is where you need to provide new lines, the priorities being the Dandenong route through Caulfield and the northern lines through Upfield/Craigieburn. Both of these are trying to shoehorn express trains into frequent all-station metro routes. It doesn’t work, and this is where the transport planners need to be focusing their investment.